Although many people have forgotten about this particular talent, the classic iPod has been able to record audio since October 16, 2003 (3G iPod or later, iPod Software Update 2.1 or later, and third-party microphone accessory required). While the ability to record audio fired the enthusiasm of some, it’s a feature that hasn’t particularly caught on. And one reason it hasn’t is because the quality of the recorded audio isn’t always very good thanks to the cheap microphones used to do the job. 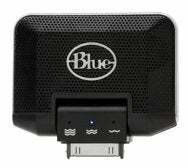 Blue Microphones has set out to change that with the release of its $80 dock-connector microphone, Mikey. This is a stereo microphone that features a three-position Sensitivity Selector (read: gain) switch that allows you to record audio whether it’s quiet (lectures), normal (voice notes), or loud (amplified music). That switch is found on the back of the microphone. Mikey also bears a swivel head that allows you to flip it up to 90-degrees forward or back, letting you place your iPod on its back while still directing the microphone at a sound source. Unlike some other iPod microphones, Mikey has no line-in jack—it’s a microphone only. Like other iPod microphones, it will record WAV files at high quality (44.1kHz, 16-bit stereo) or low quality (22.05 kHz, 16-bit mono). It works with the classic and 5G iPod and 2G, 3G, and 4G iPod nanos. Mikey is the largest iPod microphone I’ve used. And it needs to be to house the larger capsules that Blue Microphones claims are superior to those found in other iPod microphones. It works just like other iPod microphones. Plug it in to a compatible iPod's dock-connector port and a Voice Memo screen appears on the iPod's screen. Select the Record command, press the Center button, and the iPod records through Mikey. Scroll to the the Stop and Save command and press the Center button and your recording is saved to the iPod. To play back your recording, select it on the Voice Memos screen, press the Center button, move to the Play command on the next screen, and press the Center button again to play the memo. When you sync your iPod, the voice memos are transferred to iTunes on the computer. Mikey has a small mono speaker built into the back of the microphone. This speaker isn’t loud and is very tinny—it's good for previewing tracks or memos to hear what they contain, but it's not the kind of speaker you’ll want to listen to for any other reason. In my tests, Blue’s claims of superior sound appear to be true. The quality of the recordings was better than what I pulled from an old Belkin TuneTalk, Griffin iTalk Pro, Tunewear Stereo Sound Recorder for iPod, or XtremeMac MicroMemo. Overall the sound was fuller and less hissy than with the other iPod mics I tested. I also compared it to an iPhone 3G recording captured with the iPhone 3.0 software’s Voice Memos application. The iPhone’s recording was a little noisier than that from Mikey, but not glaringly so. If you have an iPhone and desire only to record voice memos, it’s a less-expensive and adequate alternative. I used Mikey to record me playing a piano, placing Mikey on top of the instrument. I flipped the Sensitivity switch to the quiet setting, figuring I’d overpower the microphone at the middle and loud settings. The results were too quiet. I then tried the middle setting and wished I had a little more gain. The loud setting resulted in distorted audio. I faced the same situation with Mikey and the iPod placed across the room to record the piano. The middle setting wasn’t quite as loud as I wanted but the loud setting was too much. I wish there were a way to dial in gain between the settings for such situations and an indicator that told me if the gain was too hot or not hot enough. As it is, you judge the distance at which you’ll record and then make your best guess which setting to use. Apart from cases where you’d like that in-between adjustment, the three settings do their job. Holding the iPod and Mikey about nine-inches from my mouth, the audio was quite good from the middle setting. From four-feet away, the quiet setting produced decent audio as well. And when I blasted music at the Mikey set to absorb that kind of punishment, it took it without distorting. That said, you shouldn’t expect miracles from Mikey. Its sound doesn’t match the quality of a dedicated field recorder. In addition to desiring those in-between settings, I wish Mikey’s Sensitivity switch was easier to manipulate. It’s quite small and placed in a groove on the back of the mic, requiring a well-honed fingernail to move it. I’d also like Mikey to sit a little more solidly in the dock connector. More than once I picked up the iPod, slightly bumped Mikey, and lost the connection between the microphone and the iPod. Mikey is the best-sounding iPod microphone I’ve used. And with an $80 price tag and no line-level input, it should be. It records very nice sounding voice memos, and though the results it produces with quiet and loud material aren't stunning, they aren't bad. If you want the best of today’s iPod mics and aren’t expecting field-recorder results, Mikey is a reasonable choice.